1. Wow! Could life get any busier?? Now that I just said that, it probably will! 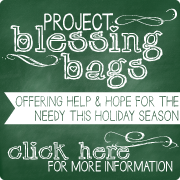 J Hopefully you caught our last post about Project Blessing Bags. (More on that in a minute.) It is keeping us busy – in a good way! 2. Did notice our new look? My sweet husband has been burning the midnight oil redesigning the Throne of Grace website. We are still under construction but welcome your feedback! • Today I am praising the Lord for my AMAZING sister, Emmy! My little sister is celebrating THIRTY-FIVE years of life. That makes me feel OLD! I couldn’t ask for a better friend, mentor, second-mom to my children, and co-laborer in Christ. • Please pray for our wonderful worker bee, Tami. She’ll be sharing a yummy Christmas recipe with us tomorrow, but today she is undergoing a breast biopsy for a questionable lump. Please pray for peace for Tami and her husband, Kyle, as they await the results. Pray that the doctor would skillfully perform the procedure and receive clear results. Pray with us that the results would be negative! • Continue to pray for Amy, who is suffering from Lyme Disease. Amy gave me an update this week. She is spending a good deal of time in bed – weak and fatigued. Let’s plead with the Great Physician to heal her body COMPLETELY! • We’ve got another Amy to pray for this week. We are so thankful God gave us Amy as a customer…she now feels like a friend! Amy’s husband is in the military and is not a believer. Please pray for the Lord to soften his heart to the truth of the Gospel and to allow Amy’s faith to win him over with a quiet and gentle spirit. Please also pray for Amy as she travels with her two small children home to be with family for a month over Christmas. Pray she would be an effective and bold witness to other unbelieving family members. • Another Throne of Grace teammate, Deb, would love prayers for her health. We’ve mentioned before that she suffers from various stomach ailments and is starting a new diet that will hopefully give her more consistency of “good” days. Pray that she can adjust easily to the new dietary rules and be patient as her body adjusts. • We are thankful for the way the Lord is sustaining young Jacob through his many rounds of chemotherapy for Hodgkin’s disease. He will be admitted to the hospital on Thursday for round 6. They are still awaiting results from the last round but are hopeful that the treatments are going well. Thank you for your continued prayers for Jacob and his mom, Lori! • Please pray for Project Blessing Bags! Pray that God would be glorified through this project and that all involved (especially the kids!) would receive spiritual blessings of increased faith as we see God provide abundantly! Please pray that God would give us the energy and resources to see this project through to completion in the midst of such a busy season. Most importantly, pray that God would use these Blessing Bags to truly be a blessing to individuals and families who are struggling and that their needs would be filled both spiritually and materially. Thank you for joining us in prayer! And thank you for your patience with us this week as we’ve been a little behind in…everything!